JOLO Mendoza fired 19 of his 30 points in the second quarter to key Ateneo's title-clinching 90-73 win over National University on Friday in the UAAP Season 77 juniors basketball tournament at the Filoil Flying V Arena in San Juan. Mendoza presided over a critical 19-2 run in the second period that enabled the Blue Eaglets, enjoying a thrice-to-beat advantage after a sweep of the two-round eliminations, to post a 52-34 lead at halftime. The former Batang Gilas standout was also there to help the Blue Eaglets weather the storm in the final quarter, nailing a jumper after the NU Bullpups had come to within 74-69. Mendoza was later named Finals MVP. The Blue Eaglets clinched the title with the loss of just one game all season. 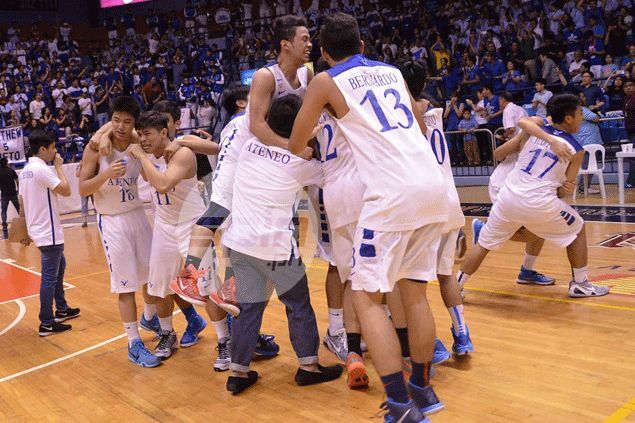 It was their first since the last of the Kiefer Ravena-led team's three successive juniors titles in 2010. At the same time, Ateneo denied NU a 'triple crown' sweep of the men's women's and junior titles this season. Matt Nieto had 25 points while his twin brother and reigning MVP Mike Nieto had 12 points in their final high school game for Ateneo before moving up to the Blue Eagles side next season. John Clemente had 24 points to lead NU, while Jordan Sta. Ana and Philip Manalang added 13 and 10 points respectively. Mark Dyke had nine points and 14 rebounds but was only 4-of-9 from the field. Ateneo (90) – Mendoza 30, Ma. Nieto 25. Mi. Nieto 12, Mamuyac 8, Salandanan 6, Ramos 5, Joson 3, Hassan 1, Ildefonso 0, Andrade 0, Eustaquio 0, Termoso 0, Bernardo 0, Gatmaitan 0, Moreno 0, Rosales 0. NU (73)—Clemente 24, Sta. Ana 13, Manalang 10, Dyke 9, Baltazar 7, Camaso 5, Atienza 3, Ferreras 2, Mina 0, De Guzman 0, Callejo 0, Claveria 0, Saquian 0, Dela Cruz 0, Penano 0. Quarterscores: 22-21, 52-34, 65-57, 90-73.